Die MAC Studio Waterweight Foundation kostet 34,50€. Die Foundation beinhaltet 30ml, hat einen Lichtschutzfaktor von 30 und ist 24 Monate haltbar. Sie befindet sich in einer Glasflasche und hat eine Pipette womit man sie dann perfekt dosieren kann, bevor man sie benutzt soll man die Flasche gründlich schütteln. Die Waterweight Foundation hat eine leichte-mittlere Deckkraft. The MAC Studio Waterweight Foundation costs 34,50€. 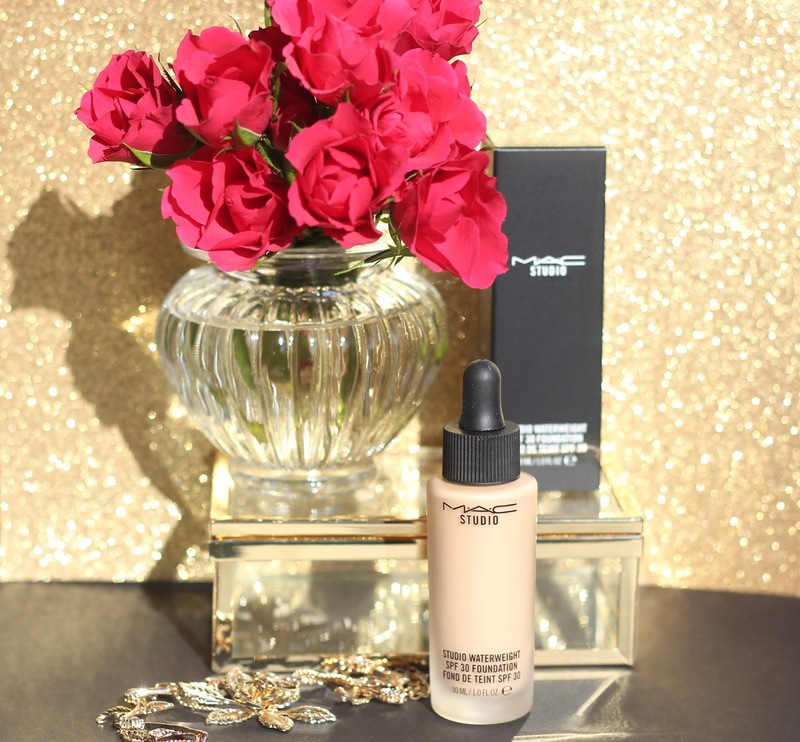 The Foundation contains 30ml, has a SPF of 30 and expires in 24 months. It is in a glass bottle and has a pipet with it you can dose it perfectly and you should shake the bottle before you use it. 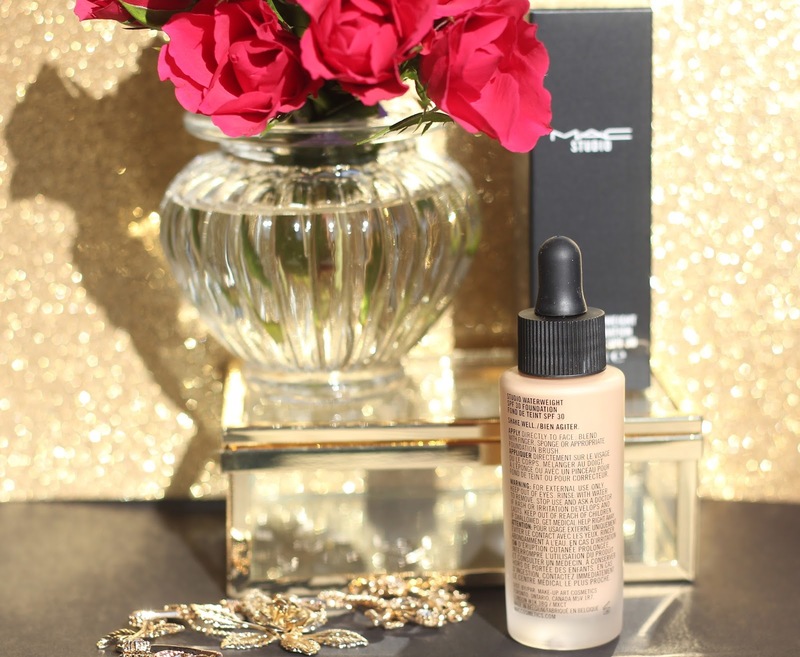 The Waterweight Foundation has a light to medium coverage. Ich tröpfel mit der Pipette etwas auf meine Hand und verteile sie mit einem Pinsel. Danach tupfe ich nochmal auf die Stellen mit meinem Pinsel drauf, die ich noch mehr kaschieren will . Die Waterweight Foundation deckt wirklich alles ab und man hat ein super schönes natürliches Ergebnis. Ich habe ja Mischhaut und habe zusätzlich noch mein Gesicht abgepudert, insgesamt hält sie bei mir nur so 6 Stunden bis sie ölig wird. Am Anfang fand ich sie echt gut wegen dem so schönen natürlichen Ergebnis aber sie ist eher etwas für meine Haut wenn sie sich wieder in einer trockenen Phase befindet. Ich habe auch keine unreine Haut davon bekommen und sie fühlt sich sehr leicht im Gesicht an als ob man nichts drauf hat. Rouge und Bronzer lassen sich auch problemlos drüber auftragen (...nicht so wie bei der flüssigen Foundation von Maybelline, da hatte ich echt manchmal Probleme Rouge darüber aufzutragen). Für super trockene Haut ist die Foundation echt empfehlenswert. Ölige Hauttypen sollten davon komplett die Finger lassen und ganz ehrlich für Mischhaut würde ich sie auch nicht empfehlen, manche könnten enttäuscht werden und andere könnten damit wieder total glücklich werden aber ich würde es bei dem hohen Preis nicht riskieren. Ich selber würde sie nicht noch einmal kaufen da mir die MAC pro longwear Nourishing Waterproof Foundation viel besser gefallen hat. I take the pipet and dribble a few drops on my hand and apply it with a brush. Then I tap with the brush over all parts again that I want to cover more. The Waterweight Foundation has a good coverage and it looks so beautiful and natural on the skin. I have combination skin and use above the foundation a powder and overall it stays about 6 hours till my face get´s oily. On the beginning I liked the foundation very much because of the perfect natural look it gaves you but the foundation is more for the days when my skin is dry. I did not break out from the foundation and it really felt lightweight on the face, like you have nothing on the face. I could apply Blush and Bronzer without a problem (... on the liquid Maybelline Foundation I had sometimes problems to apply bronzer and blush). I would recommend this foundation for super dry skin. People that have oily skin should avoid it and really honestly I would not recommend it for combination skin either because some people could be disappointed and some other could be super happy with it, but I would not risk it because of the high price. I personally will not purchase it again because I liked the MAC pro longwear Nourishing Waterproof Foundation more.